Sen. Marco Rubio, R-Fla., a member of the Senate Intelligence Committee, is a tough critic of the Trump administration's stance toward Russia. 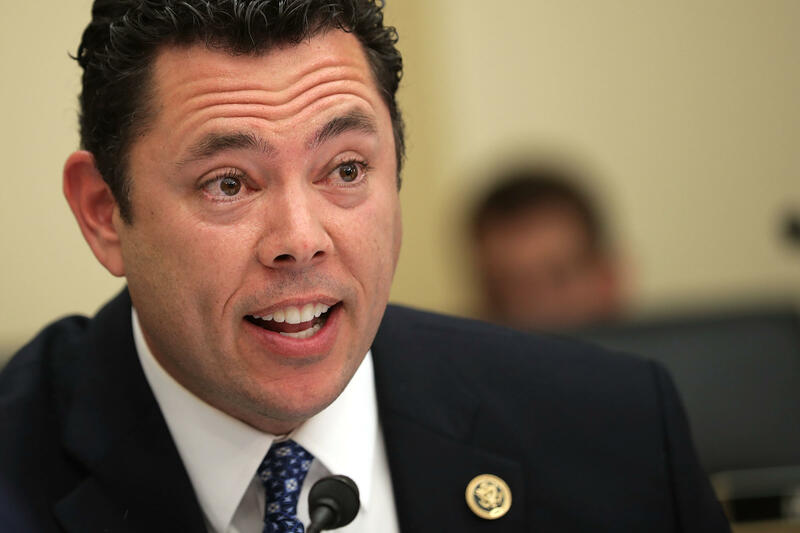 Rep. Jason Chaffetz, R-Utah, the chairman of the House Oversight and Government Reform Committee, is calling on Attorney General Jeff Sessions to recuse himself from the federal investigation into Russian efforts to influence the 2016 election. Senate Minority Leader Chuck Schumer, D-N.Y., speaks to reporters Thursday about news reports of Attorney General Jeff Sessions' contact with Russia's ambassador to the U.S. during the presidential campaign. A handful of top Republicans are calling on Attorney General Jeff Sessions to recuse himself from a federal investigation into whether Russia interfered with last year's presidential election, as top Democrats call on Sessions to resign. The demands come after reports that Sessions spoke to Russia's ambassador twice last year, while Sessions was working as a top adviser and surrogate for Donald Trump's presidential campaign. The news was first reported by The Washington Post and has since been confirmed by NPR's Carrie Johnson. Sessions said during his confirmation hearings that he had no contact with Russian officials as he worked with Trump's campaign. Amid the calls for recusal and resignation, many leading Republicans are urging caution. 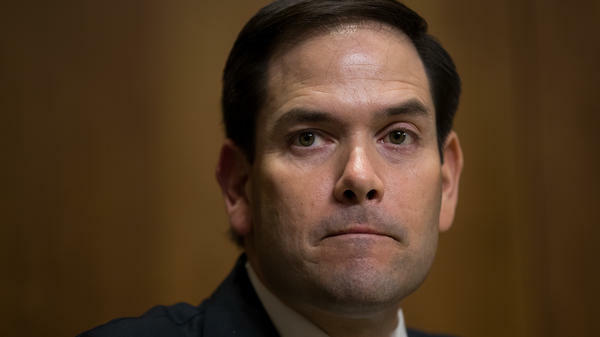 Sen. Marco Rubio, a Republican who has been highly suspicious of possible links between the Trump campaign and Russia, told NPR's Steve Inskeep on Morning Edition, "I'm not interested in being part of a witch hunt, but I also will not be part of a cover-up," speaking about the broader Russia investigation, which he is a part of on the Senate Intelligence Committee. Democrats have been making demands for Sessions to recuse himself from the federal Russia investigation for weeks, repeating it at every development in the story — including the recent resignation of national security adviser Michael Flynn, who stepped down after making misleading statements about his own contacts with Ambassador Sergey Kislyak to Vice President Pence and other top White House officials. The Sessions news was enough to move several high-profile Republicans into the camp, too. Utah Rep. Jason Chaffetz tweeted Thursday morning that "AG Sessions should clarify his testimony and recuse himself." That's a reference to the fact that during his confirmation hearing, Sessions told the Senate Judiciary Committee that "I did not have communications with the Russians" over the course of the 2016 presidential campaign. Later in the morning, California Rep. Darrell Issa issued a statement saying "we need an independent review by a credible third party, and ... Attorney General Sessions should recuse himself by any investigation into Russia." Issa barely won re-election last year and is viewed as one of the most vulnerable House Republican incumbents. But Ohio Sen. Rob Portman is on the opposite end of the spectrum. He was recently elected to a new six-year term and won a second term by wide margins. Still, Portman said in a statement that "Jeff Sessions is a former colleague and a friend, but I think it would be best for him and for the country to recuse himself from the DOJ Russia probe." House Majority Leader Kevin McCarthy said on MSNBC Thursday morning that Sessions should recuse himself from any Russia-related investigation, but later he attempted to walk the statement back. Indeed, many Republicans, including House Speaker Paul Ryan, are defending Sessions. Ryan told reporters Thursday that Sessions should only recuse himself from the investigation if he becomes the subject of the probe. "But if he's not," Ryan said, "I don't see any purpose or reason to doing this." As Republicans begin to join them on the recusal front, many Democrats in Congress are ratcheting up their demands. Senate Minority Leader Chuck Schumer and House Minority Leader Nancy Pelosi are now calling on Sessions to resign. "There cannot be even the scintilla of doubt about the impartiality and fairness of the attorney general, the top law enforcement official of the land," Schumer said. "Because the Department of Justice should be above reproach, for the good of the country Attorney General Sessions should resign." Schumer also said Deputy Attorney General Dana Boente should appoint an independent prosecutor to look into Russia's attempted influence in the 2016 election to ensure the integrity of the investigation. 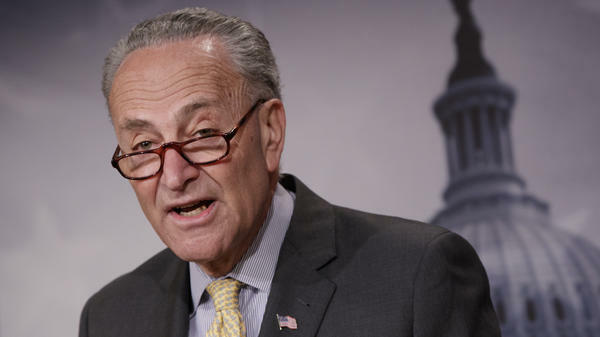 If that doesn't happen, Schumer said, Congress should revive its own power to name an independent prosecutor, which was created in 1978 after Watergate and lapsed following the Kenneth Starr investigation of President Bill Clinton in the 1990s. Schumer also called on the Justice Department inspector general to begin an immediate investigation. "After lying under oath to Congress about his own communications with the Russians, the Attorney General must resign," Pelosi said in a statement Wednesday night. "Sessions is not fit to serve as the top law enforcement officer of our country and must resign." "This is the No. 1 law enforcement officer in the country. He sets the example for U.S. attorneys all over this country, and he also is the person who is in charge of the FBI," Elijah Cummings, the top Democrat on the House Oversight and Government Reform Committee, told NPR's Morning Edition on Thursday. What happens next may depend on the ultimate response of high-profile Republicans like Marco Rubio and Ryan, who want to know more before making any judgments about Sessions' role going forward. Rubio is a member of the Senate Intelligence Committee, which is conducting its own investigation into potential Russian electoral interference. "It is potentially the case that there is going to be Justice Department recommendations or referrals based on anything regarding the campaign," Rubio said on NPR's Morning Edition. "Depending on what more we learn about these meetings, it could very well be that the attorney general, in the interest of fairness and in his best interest, should potentially ask someone else to step in and play that role."